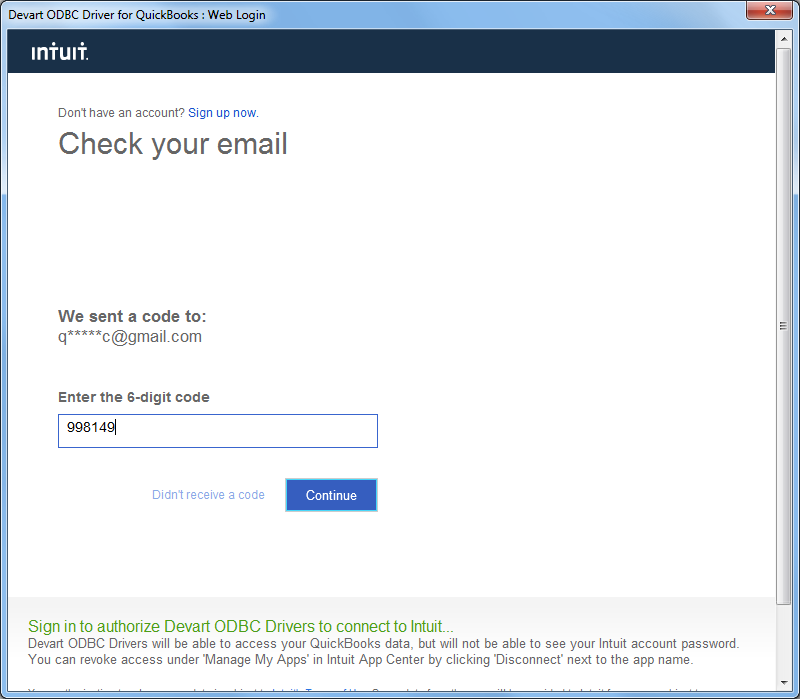 The article describes installation and configuration of Devart ODBC Driver for QuickBooks on Windows, as well as authorization and connection to a QuickBooks account, and provides a demo sample of retrieving QuickBooks account data using Microsoft SQL Server Management Studio. 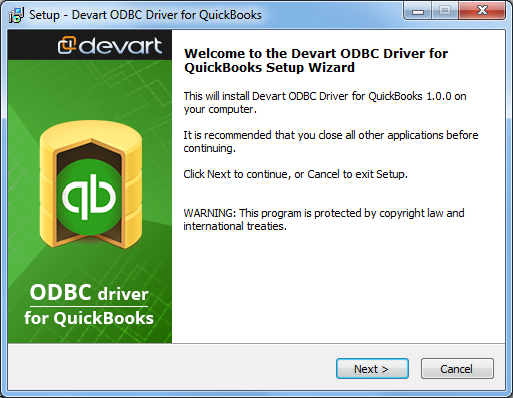 Before installing the ODBC driver, make sure that another version of Devart ODBC Driver for QuickBooks is not installed on the PC, since more than one version cannot be installed simultaneously on one PC. Also make sure there is .NET Framework 4.5 installed on your system. 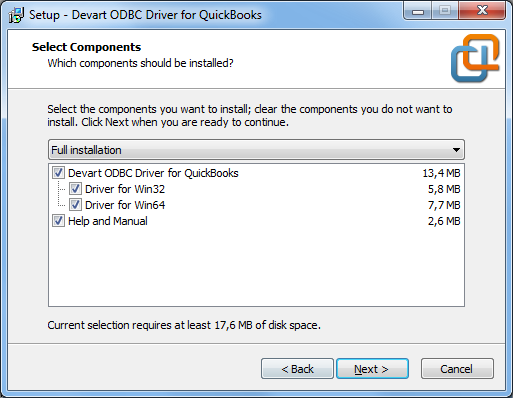 Devart ODBC Driver for QuickBooks currently supports Windows 32-bit and 64-bit. In case if you already have the specified installation folder on the PC or another Driver version is installed, you will get a warning. Click Yes to overwrite the old files with the current installation, but it is recommended to completely uninstall the previous driver version first, and then install the new one. On the Select Components page you can select whether to install the 64-bit version of the driver or not. Clear the check box if you need no 64-bit installation. There is also a check box on this page, that allows you to select whether to install Help and Manual. On the License Information page, you should select the license type and activate the product. Read the Driver Activation During Installation article for more details about this step. If you have no License Key, you can select Trial and use the driver for evaluation purposes. Click Next. Then you need to configure the driver. After the driver is installed, it should be configured. 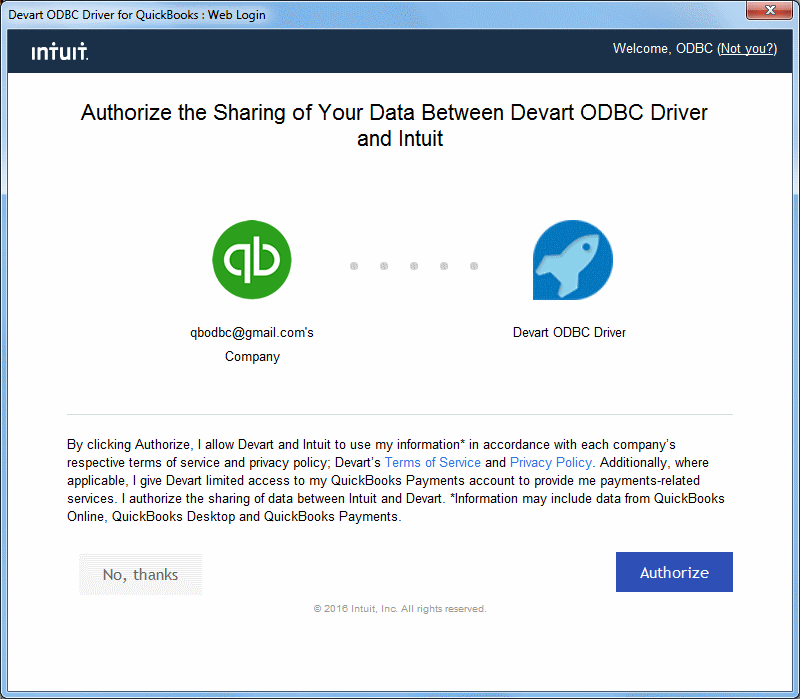 Now you have to add the Devart ODBC Driver for QuickBooks to the list of System Data Sources or User Data Sources or File Data Sources using the ODBC Data Source Administrator dialog. 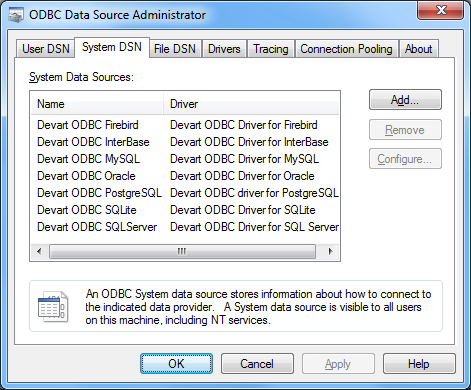 For this, click the Add button – the Create New Data Source dialog will appear with a list of available drivers. 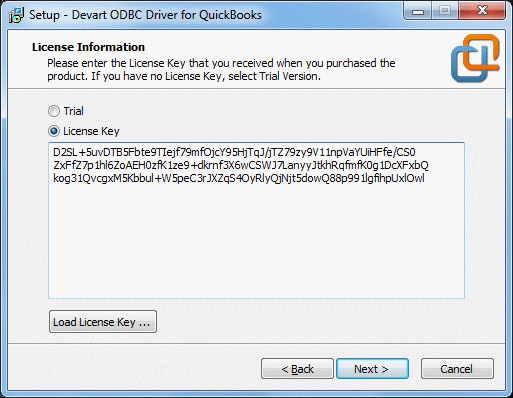 Select Devart ODBC Driver for QuickBooks and click Finish. Then you will be suggested to configure the driver. 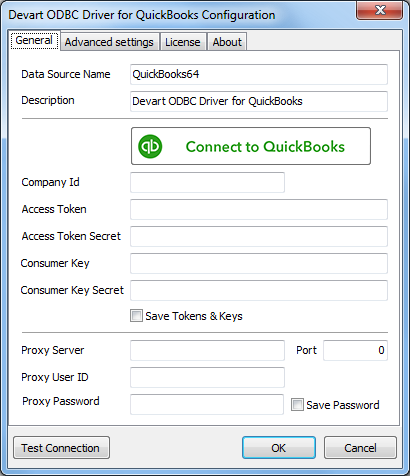 In the appeared connection dialog, specify Data Source Name and its Description and click Connect to QuickBooks button. If you want to save tokens and keys in order to be used for new connections, select the Save Tokens & Keys checkbox. 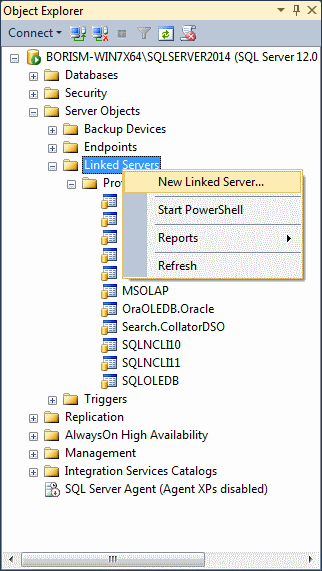 Then you can click OK and finish configuration or switch to the Advanced settings tab to specify more detailed Connection String. See the full list of supported connection options in the Connection Options article. 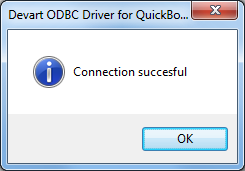 To activate the driver via ODBC Administrator, refer to the Driver Activation After Installation article for more details. 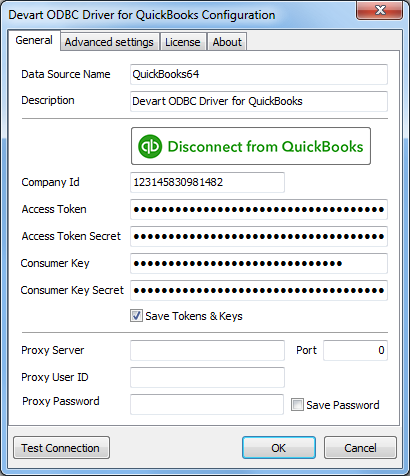 Now, when the driver is connected to QuickBooks, we can retrieve QuickBooks company data. 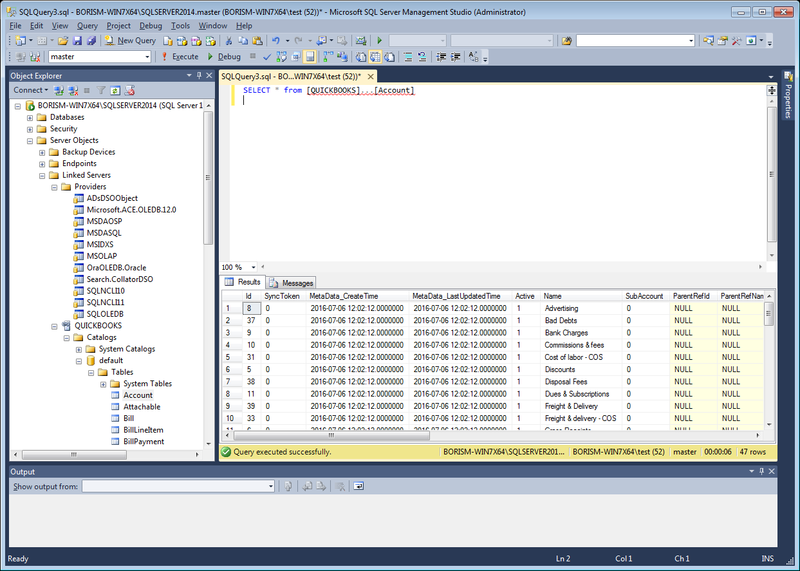 To demonstrate it, we used Microsoft SQL Server Management Studio (SSMS). You can repeat the following steps, that we performed. The data source must be a configured system DSN. 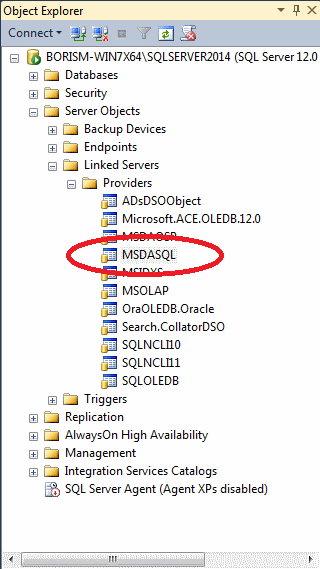 The driver, studio, and SQL Server must be of the same bitness. 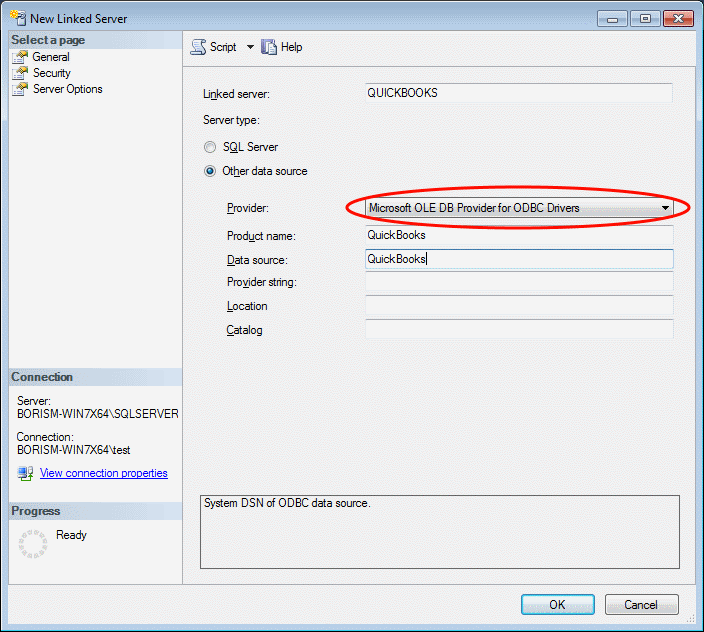 For example, if you are using 64-bit SQL Server Management Studio on 64-bit Windows platform, then configure the 64-bit version of the driver using ODBC Administrator launched from %windir%\system32\odbcad32.exe. Otherwise, configure the driver using the 32-bit version of ODBC Administrator – launch it from %windir%\SysWOW64\odbcad32.exe. 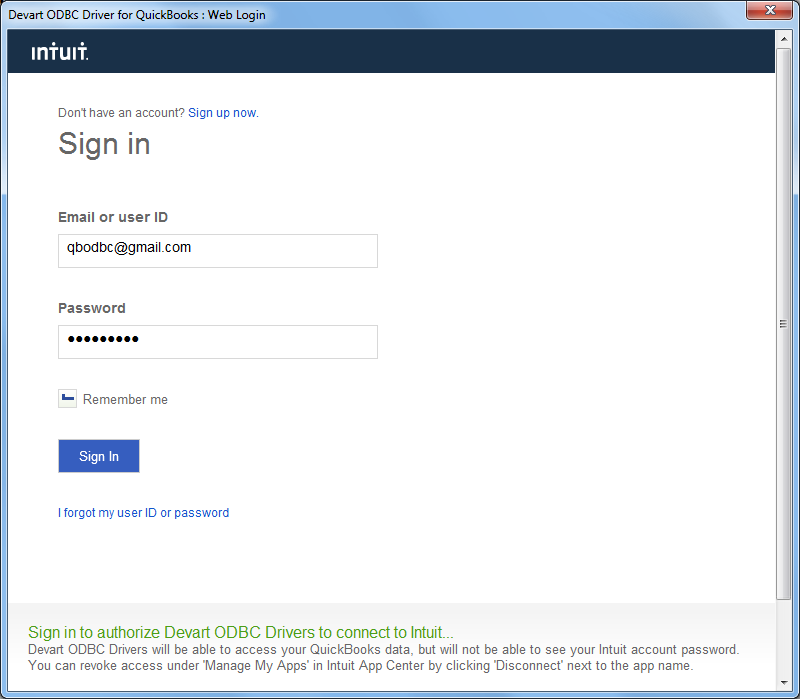 ODBC Driver for QuickBooks and SQL Server must be installed on the same computer. .NET Framework 4.5 must be installed on the computer. As a result, you can see the contents of the Account table retrieved directly from the QuickBooks account you are connected to.